Posts about games are going to be very rare on this blog, because I’m not really a gamer. Every now and then I think about giving it a go. About twenty years ago I moved into my first flat. Obviously no self respecting bachelor pad would be complete without a games console so I bought the original Playstation. It came bundled with a few games, but I can’t even remember what they were – probably a driving game and some kind of sports game. They didn’t grab me. I’m not sure why I bought Spyro the Dragon, but it had me hooked. The gameplay was simple enough to understand for a casual gamer but it still got challenging – for me, anyway. You can keep your realistic simulations – give me a playable cartoon any day. Perhaps it’s because I grew up playing games like Manic Miner and Jet Set Willy on the ZX Spectrum. Simple graphics often look better anyway – attempts to be photo realistic just highlight limitations of the current state of the art. For the most part, though, the PS1 gathered dust. Fast forward twenty years and I have a PS4 that, in addition to gathering dust, is mostly used as a DVD player. When I do play, I’m still drawn to simple, relatively easy, games that let me just switch off and have a bit of fun. It seems to me that many of the bigger games aren’t all that accessible for the casual gamer. As a fantasy geek fan I’d like to try Skyrim, but the learning curve is massive. Simple platform and collectathons definitely seem more suited to occasional gaming. When Spyro Reignited came out I had to get it. My initial impression was that it looked amazing. For its time, the PS1 version was impressive, but the progress over the last twenty years has been incredible. On the downside, it does demonstrate that I don’t have what it takes to be a proper gamer and also has examples of some of my pet peeves in games. 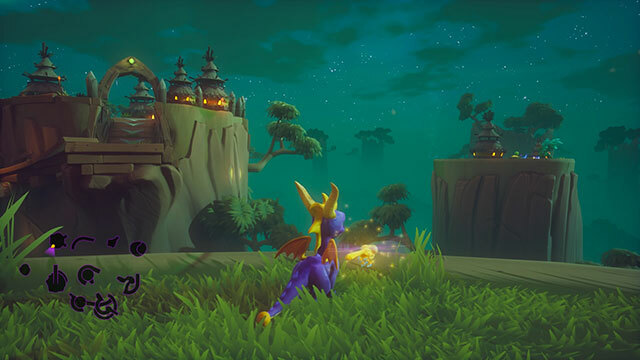 For the most part Spyro is pretty easy. The difficulty level ramps up as the game progresses, but mostly by having more enemies and less food to recover from hits. 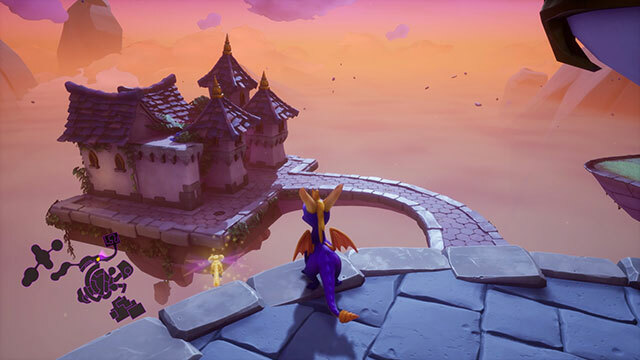 It’s not always consistent – Misty Bog, in the middle of the game, is probably tougher than some of the later levels, and Gnorc Cove near the end is relatively easy. There are, though, a few things that are dramatically harder than the rest of the game. The egg thieves are the first example, at least if you have middle aged reactions. I lost track of the number of times I charged off of a cliff because I wasn’t making the turns and after about two or three loops around a thief’s route without catching him it starts to get tedious. It’s important to get the hang of the fast moving charges, though, because the egg thieves are as nothing compared to the supercharge ramps. Especially the levels that require charging around several ramps and timing a jump at the end. I’ve watched walkthrough videos, and I’m pretty confident I’ll never be able to reach the last dragon in Treetops or Haunted Castle. I can’t even seem to master the simpler jump in Lofty Castle. Another peeve is games that have subgames that are completely different to the main game. If I’m playing a platform game, I want it to remain a platform game. 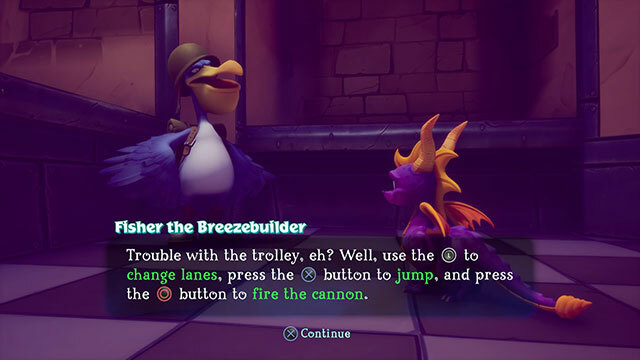 This isn’t a criticism of Spyro in particular. Many games have something similar. It’s probably done with the best of intentions, to keep gameplay interesting and varied. Perhaps it’s because you’re expected to invest so much time in games now. Back in the old days if you wanted a different type of gameplay after an hour or so, you’d just load another game.